Alice turned 100 years old this past November. She is actively involved in the life of our congregation. She’s been an active participant in this congregation (and Calvary Baptist before us) for ALL of her life. So she’s her lots of sermons over here lifetime. So, when Ms. Alice requested a copy of this sermon to read, I was most honored. She said it was one of the best sermons she’s ever heard. The sermon tries to draw some lessons we can learn as a congregation from the busted water pipes (over 57 at last count) coming out of the recent harsh winter here in Richmond, VA. Drawing on the story of David’s desire to build a temple, when God seemed more than satisfied with a tabernacle (tent), the message challenges the congregation to located CHURCH outside the building they typically call church. Thee audio is a little off again this week. Not sure why, but we’ll fix it. Whenever you visit a blog, please be kind to the blog publisher. If you find a post helpful, inspirational, or even a bit controversial, PLEASE SHARE via social media. There are several links on this page to make such SHARING much easier. The scripture text is below, follow by the video, and then the manuscript of the sermon. I have in my hands a souvenir from the recent ice storm that caused such a large amount of damage to our church house. 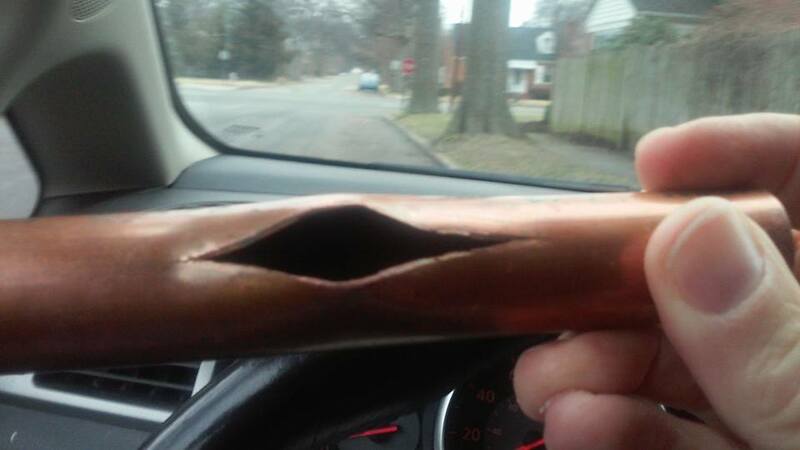 It’s a 6-5 inch piece of copper pipe that was burst by the frozen water. It really is amazing how much destruction a little bit of frozen water can cause. Most of us have had frozen water in a soft-drink during the past week. A little piece of ice like that caused this pipe to burst. In fact, I spoke with the guys from Bradley Mechanical this past week as they continue repairs. At last count, they had found 57 places along the pipes where frozen water created a burst just like the one in this little bit of copper piping. Now I am not sure exactly why this happened? Not sure if the heat failed or the extreme cold overwhelmed the heat. But something happened, and we know the results.. The pipes burst…in bathrooms, radiator units, and the sprinkler system that protects the church house from fire. The water began to flow, several gallons per-minute. It started in the “Welcome Center” and flowed through the offices, causing damage to the paper, books, carpets, and more. Then it continued down the hallway of the education building, causing damage in the nursery, the class where the Virginia Homes residents have Sunday School, and all the way down into the fellowship hall. Because some of the water pipes were from the fire prevention sprinkler system, the nearby fire department received an alarm. They came out and shut off the water. If they had not responded, the damage could have been catastrophic. In addition to shutting off the water, they also had to shut off the electricity. That meant that the sump pump in the basement stopped working. Knee high nearly frozen water filled the basement area where the furnace is kept. That was the first thing that had to be addressed, to try and prevent too much damage to the furnace. I was down here with the repair men tried to get all the water pumped out of the basement. At first, for every gallon they pumped out, two more gallons seemed flowed in. They finally found a way to make that stop and got that issue resolved. Frankly, if Tommy Richardson had not stopped by the building as early as he did, many of the furnishings and office equipment would have been destroyed. In addition to Tommy, Jerald and Mike Utely spent many hours daily here at the church house waiting for plumbers, restoration folks, and insurance agents to investigate and repair. Additionally, all this happened at a time when Brian Snead was recovering from surgery. He needed to be at home resting, but he was here on many occasions at well. Tommy, Jerald, Mike, and Brian, do not like to call attention to themselves or take credit for the stuff they do, but I think we owe all of them a debt of gratitude for all they have done. We missed gathering one Sunday as a result of the ice and cold. We’d of missed that Sunday even if the pipes had not burst. The following Sunday a small group of us met in the basement of the Monument Heights Baptist Church. That was a bad weather day, too. Many other congregations were closed as well. The next week we met here for worship. We had no Sunday School that week, but a larger than average crowd did gather for coffee and doughnuts. This prompted several to suggest that we should feature doughnuts before every worship gathering. This tragedy happened at the front end of our Lenten worship gatherings. Lent is a time of personal reflection and sacrifice offered in order that we might better remember God’s gifts of life and grace. So, with this being the season of Lent, and with this copper pipe sitting in front of us, I would like to invite you to explore with me what we might learn from this situation. What are some possible “Lessons From A Busted Water Pipe”? I call your attention to 2 Samuel 7:6. The context is simply this: King David was surveying his palatial estate which symbolized his power and wealth. As he did so, he noticed the tabernacle. The tabernacle was the tent where the Israelites had worshipped God during their days as wandering nomads. King David comes up with an idea. “I’m going to build me a temple for God.” That’s not an exact quote, but I think it gets to the heart of the matter. The tabernacle was an eyesore next to his stately manor. David wanted to build his patron deity a new house. Now notice that the notion to build the temple did not originate with God. God had commanded the building of the tabernacle. But God never initiated, asked for, requested, nor commanded the building of the temple. God provided blueprints and instructions for the construction of the tabernacle, but God never did that for the temple. And while we do not know what happened with the tabernacle, we do know that God seemed willing on more than one occasion to allow the temple to be toppled and destroyed. All in all, it seemed like God tolerated the temple, but loved the tabernacle. One lesson that we can learn from both our text and our experience with busted water pipes is that this building should never be the center of our focus and attention. This building is NOT the church. This place is NOT what the Apostle Paul refers to as the “body of Christ.” This place is not where God lives. This is a meeting house for our celebrations of worship. This is a place for Bible study classes and occasional fellowship activities. This can become a place in which we engage our community to events aimed toward ministry and mission. But this place is NOT the church. You are the church. We are the church. We are the body of Christ. Every one of us is a part of it. We are the incarnation of Jesus in the world just as he was the incarnation of the Father. Our world will not best see Jesus or hear his Gospel in this building. It will best see and hear and experience the person and presence of Jesus by the things we say and the way we live our lives outside the walls of this building. The first lesson we can learn from the busted water pipes is that this building is NOT the church. A second lesson to learn is that it is better to be a tabernacle Christian than a temple Christian. I know we are still toward the middle of Lent, but if you don’t mind, let’s jump ahead a few weeks into the season of Easter. One of the things we see in the resurrection of Jesus is the reestablishment the tabernacle motif. Here’s what I mean. The post-resurrection Jesus is never stationary and static. Jesus is always on the move. In the stories of Jesus resurrection, the angelic visitors who declare his resurrection tell the women, “Go find his disciples and tell them that he has gone on ahead of your into Galilee.” From this point on, Jesus is always on the move. The moment they think they have Jesus cornered, he vanishes from their site and moves to a new location –the upper room, near the lake, on the road to Emmaus, and at Mount Olivet. Jesus is always on the move. This is true of the Holy Spirit as well. Read the Book of Acts. When the Spirit comes upon the disciples while they are gathered in prayer, the first thing the Spirit does is move them into their community. The Spirit led them into the highways and by-ways, onto the side streets and sidewalks, into the neighborhood and shopping centers. From the day Pentecost forward, the Spirit moves the church farther and farther away from the temple (both theologically and well as geographically). The Spirit is with the Jewish converts as they are disperses across the region. The Spirit is with Paul as he takes the gospel on missionary journeys into Gentile lands. Just as God loved the freedom of the tabernacle, so, too, does the post-resurrected Jesus and Holy Spirit seem to love being on the move. Jesus was always out just a few steps ahead of his disciples. The Spirit is always seen pushing and prodding the disciples to expand beyond their comfort zones. The church, today, needs to follow Jesus, by the power of the Spirit, outside the confines of the buildings it keeps in its possession. We need to step outside the comfort zone of this building to connect with new people in different places so that we can incarnate (embody) the presence of Jesus that we proclaim the gospel. The temple mentality is settle and stationary. The tabernacle mentality is active and moving, and Jesus calls us toward a tabernacle style of discipleship. Our denominational traditions have taught us to count pennies in the plate and people in the pew. I can remember the offering envelopes which inquired about whether I was in Sunday School, had brought my Bible, was giving my tithe, and would be present in worship. These are the metrics of a temple mentality. These are the “come structures” by which we have been taught to evaluate our sense of success and well-being as a church. Maybe that is why so many of us have been depressed as of late when we gather together. It we count using the temple metrics, we feel like we are faltering and failing. Four or five years ago, we were welcoming new members regularly. Young people and some adults were being baptized regularly. We were occasionally seeing over 100 in Sunday School and 125 plus in worship. On high Sunday’s like Easter we would kiss the 200 plus mark in worship, and it made us feel good about ourselves. But then in a matter of just a couple years, our college students from MCV graduate and move out of the area. Most of our teenagers graduated high schooled and move away to college. Folks who were active in our fellowship relocated into different communities or nearby nursing homes. Most stressful of all, we have stood near the casket of nearly 50% of our active worship participants. Then the water pipes froze and busted in 57 places. Talk about adding insult to injury. If our God abides in the temple, then His metric is going to be people in the pews and pennies in the offering plate. But what if God really does prefer the tabernacle over the temple? What if Jesus really is on the move ahead of us in the community? What if the Holy Spirit drive the disciples out of the upper room and into the market place, school yards, and community centers? What if Jesus really meant exactly what he said when he told his disciples to GO and makes disciples of all people. What if we really are suppose to start here…and then move into “Jerusalem, Judea, Samaria, and to the ends of the world”? What if we need to get out of the building and into the world to truly meet Jesus and be his fully devoted followers? What might some of those GO STRUCTURES look like? What if every organizational structure in the life of Patterson Avenue Baptist Church committed to spending at least 50% of its time and energy praying and strategizing how to go and build relationships with those beyond these meeting house walls? What if the deacons, every Sunday School class, the choir, the Praise team, and the WMU spent 50% of time and resources trying to discern ways to get outside of these walls and into our community? What if, instead of counting people in the pew on Sunday, we started tallying how many relationships we established with the needs of our community? What if we started counting how many children’s lives were touched by those tutoring with the Micah Project? What if we started counting and celebrating how many partnerships we make with business, civic, and charitable organizations? Here’s the point: The call of God is not that we COME to a building. The call of God is that we GO from this building into our communities to be the incarnational presence of Jesus. Let’s think about Jesus for a moment. We know that Jesus spent a fair amount of time teaching in the synagogue and making pilgrimages to the temple. We know that because when he went to those places he often caused turmoil challenging their settled and exclusive attitudes and actions. The vast majority of the time, however, Jesus was not involved in the religious institutions of his day. He was out and about connecting to people in his world. We see Jesus invited into the homes of tax-collectors for dinner parties. We see Jesus at weddings celebrations making the best wine anyone there had ever tasted. We see him at the border near Samaria healing a colony of lepers. We see him at the well with a women of ill-repute. We see him near the sick, hurting, and infirmed brining healing, hope, and life. We see Jesus with the grief stricken bringing joy by raising the dead. We see Jesus fully participating in the lives of the people around him, and in so doing he brings life, hope, joy, inclusion, acceptance, and grace. How exciting it would be if we got outside this building and into people’s lives in the same way and instruments of God’s grace! What if these kinds of things were the metrics we counted as a means of seeing celebrating the movements of God in our midst? You know a few years ago I was very sick. It was the occasion of Lee’s 25th anniversary celebration with this congregation and I was unable to attend. I was dizzy, weak, and nauseous. My cholesterol was high. My triglycerides were high. My blood pressure was high. My blood glucose was extremely high. I knew that something needed to be done or I would be done for. At our silent auction during our Spring “Fun and Fitness Festival,” I won a year’s membership to Gold’s gym. I have since won and additional two years worth of membership. I have been very committed to my physical health and well-being. I have worked hard to lose weight and get in shape. “Well, I am just a little depressed. One of the patients on the floor where I work just died. It’s the first time anyone has died while I was in the room. I haven’t been able to catch up with my Priest. I am just not sure I can do this anymore,” she said as a tear streamed down her face. Here are six spiritual conversations with people outside these walls. Each one started as an invitation from the other simply because of my faith in Jesus. That’s just in the last few months. There have been many dozens more. What if when we do gathered in this building we began to count all similar conversations that each of us have had throughout each week? What if our gatherings were a time to pray for these developing relationships and the witness to the Gospel these relationship afford us? As I wrote, two young ladies seated at tables next to mine started a conversation, inspired by tea-shirts each wore that included a Christian theme. Both were recent college graduates and just a few months living in Richmond. One of them turned toward me and apologized if their conversation was disturbing me. “My goodness, no!” I replied. “I am a pastor and am happy to see how God has created a new friendship right here in my presence.” There were two older men standing nearby. They were looking at the cover of “Easy Rider” magazine. One of them volunteered his input. “I do not like churches and I do not trust any preachers,” he said. “They are all self-centered and greedy.” Well, that’s quite the challenge. “I know lots of preachers,” I said. “Most of us are not like that at all.” The man immediately apologized. “The words just came out before I could stop them,” he said. I’ve had several bad experiences with churches and pastors. These two young ladies invited these two two elderly men to join them for conversation. One of the gals bought each of these men a cup of coffee. For the next thirty minutes, we all listened as this man shared his story. I received a phone call and needed to leave. As I excused myself, one of these young ladies said: “I get what you are saying about some churches. I bet that man’s church is not like that. Neither is mine. We really try to love people because we’ve met Jesus…” At that point, I had walked to far away to hear what she said next. But I had heard enough. A temple mindset thinks that church is a place where we gather and fix busted pipes. A tabernacle mindset sees church as the people of God called to enter the world, to love people, and to minister to their needs in the name and spirit of Jesus. That’s who we are. WE are the church. The church is not a building of bricks and mortar and busted water pipes. We are the church. We are the body of Christ. Let’s be who we are this week on every occasion possible. “Why?” seems to be on the lips of many church, judicatory, and denominational leaders today. “Why has our church plateaued?” “Why are so few young leaders going into church-based ministries?” “Why are so few interested in church these days?” Recovering Hope uncovers the “whys,” creating space to embrace new realities, commit to the tough road of recovery, and develop new skills, structures, and ministry designs through a process of spiritual discernment, congregational coaching, and a deeper reliance on the work and ministry of the Holy Spirit. Eddie Hammett, a Professional Certified Coach and Church and Clergy Coach for the Cooperative Baptist Fellowship of North Carolina, provides a step-by-step process of hope and health to encourage, guide, and inspire pastors, leaders, churches, regions, and denominations that recovery of hope is possible. A TCP Leadership Series title. These sort of sermons punctuated my first twelve years on earth. I am sure they have some effect. My surroundings were UK 60s Methodism with only a passing reference to Wesley who believed in the experience of being born again. Certainly I got nowhere until , disappointed with Christianity……it had nothing to do with the book…. I became atheist at 12. Indeed it was only outside…..a few hundreds of yards outside that I found Christ through Billy Graham films in a Christian outreach centre to youth. At some point we have to ask Jesus into our life and let Him steer.